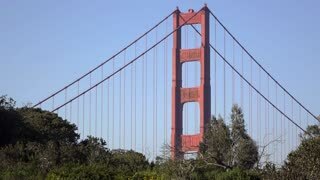 An establishing shot of the Golden Gate Bridge at dusk. 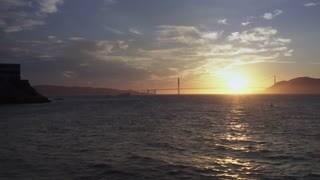 An establishing shot of the Golden Gate Bridge at sunset. 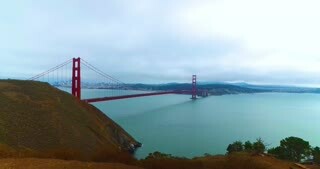 SAN FRANCISCO, CA - Circa October, 2015 - A daytime establishing shot of the Golden Gate Bridge. A daytime establishing shot of the Golden Gate Bridge as a waves crash the rocky shoreline. 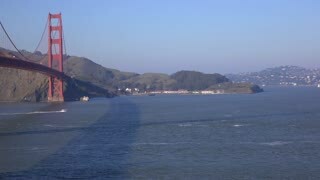 A daytime establishing shot of the Golden Gate Bridge as a Navy ship passes underneath after Fleet Week. 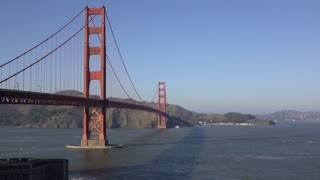 A daytime establishing shot of the Golden Gate Bridge as a sailboat passes underneath.